Cutting felt with Cricut Maker to Create DIY flowers! Cutting felt with Cricut is super easy with these simple tips. Follow along to learn how to make felt poinsettias. I have a confession to make…plants and I don’t get along. Not to brag, or anything, but I can kill any plant. Really, any! I would call it an accomplishment, but it sure doesn’t feel like one. Drought-resistance, low-maintenance… those words mean nothing to me. They don’t last. It seems that I didn’t get my incompetence with plants from my mother, as she, unlike myself, is a plant whisperer. She gives me plant, after plant, hoping-praying, really- that it would last for longer than a few months. Spoiler alert: They didn’t. The planter in my bathroom has looked like this for a year, begging for something to be put in it. So, I’ve finally come to the realization, I just need to switch to faux plants. And the good news for black-thumbed people like me is that it’s easy to make flowers that won’t die. Today I’m going to show you how I made a bunch of felt poinsettias for the upcoming holiday using my best friend, my Cricut Maker. But if you don’t have a Cricut, don’t fret, I’ll let you know an alternate way to make them! Cutting felt with Cricut is super easy with the new Cricut Maker and rotary blade. Then all you need is some hot glue to put them together and these “plants” should last a lifetime! Woo Hoo! If you want more information on a Cricut machine and all that it can do, check out this Ultimate Guide of Cricut Ideas. 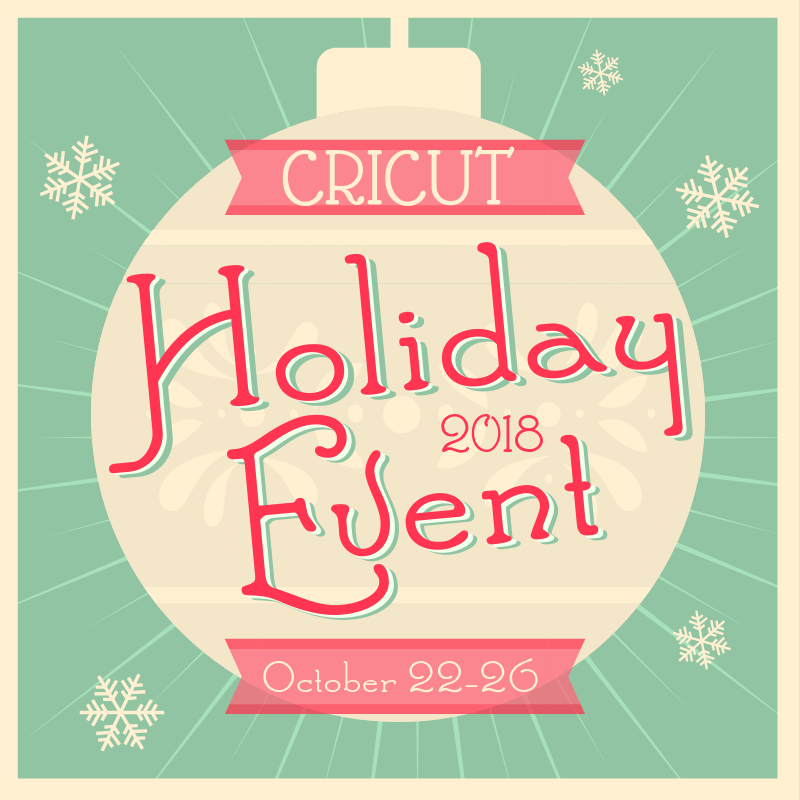 This post is also part of a Cricut Holiday Challenge link party. Make sure to read all the way to the bottom to get inspired by a bunch more Cricut inspired holiday tutorials. felt – soft or the stiffer sheets both work. The stiffer ones won’t fall like “real petals” though. I have used my Cricut Explore to cut felt in the past. The stiffer felt worked better and the deep blade was needed. But since I have the Cricut Maker now, I wanted to see what it could do! I cut both the stiffer felt sheet and regular felt fabric. I first tried to use the basic felt setting in the drop-down menu. The basic felt setting uses the regular blade. However, I did not get a clean cut. I figured the rotary blade would cut better and boy I was right! I ended up using the setting “Felt, wool fabric” that required the rotary blade. Use a fabric grip mat and smooth out the felt with a brayer. I have files and directions for two different types of DIY poinsettias: the first is a tall dimensional poinsettia that you will be gluing the leaves to a stick. The second is a flat version. If you don’t have a Cricut, no worries! Download the PDF here, print it, cut out the petals and use them as a template to cut out felt petals and leaves. You can enlarge the size before you print it if you’d like. Or click here for flat poinsettia PDF. The first thing you’ll want to do is download this free Cricut cut file! CLICK HERE TO DOWNLOAD DIMENSIONAL POINSETTIA SVG. Upload it into Cricut Design Space. If you need help with this part watch my uploading files to Cricut Design Space tutorial. There are three different size leaves and one multi-petal image. Cut out 5 of each leaf (5 small red, 5 medium red and 5 large green) and one red multi-petal image. DOWNLOAD FLAT SVG FILE HERE. Upload the SVG to CDS and size to however big you want. Cut out one of each multi-petal and 4-5 single leaves depending on how many green leaves you want. Look how beautifully the Cricut cut felts with the rotary blade! Pull the felt up and remove the petals and leaves from your mat. Assembling the felt poinsettias is super easy with a glue gun. Make sure to watch the video at the top of the post to see how to put the two different options together. If you prefer printable directions, click on the print button on the card at the bottom of the post. Glue each layer together in the middle. Place the green leaves wherever you want them and glue them in place. Add a little hot glue (clear or gold glitter) to the center and place on some gold beads. Glue the small multi-petal cut out to the top of the wooden stick. Glue the 5 smallest red petals around the wooden stick. You can either put glue on the stick and press on the petals or add some glue to the petals and then stick them on. Once you have the five smaller petals on, glue on the bigger red petals trying to space them out so the points are in the middle of the smaller petals. Then glue the green leaves on a little farther down on the stick. Again, add some hot glue to the center and sprinkle on some glass beads. They are ready to stick in a planter or jar. Arrange the poinsettias by sticking the wooden dowel into floral foam, or laying the flat ones anywhere you want them. I also added some faux baby’s breath I had from another flower display. I used four of each type of felt poinsettia to fill up the planter. Cutting felt with Cricut is a perfect to make DIY flowers. If you’d like to browse a bunch of other Cricut Christmas ideas click on the purple link. What a difference some felt makes, right? Above the felt poinsettia display, I put this Christmas tree shelf I made along with a cute little picture frame I added vinyl to with my FREE Christmas SVG file. Click on the purple links to check out full tutorials. On the opposite wall, I made this cute chalkboard sign using an old frame and a FREE SVG file! I LOVE how my bathroom is looking with DIY festive Christmas decor. Is it wrong to admit I want to just go sit in there with the door closed and just enjoy??? SSshhhh, don’t tell my family! Make your own felt poinsettias quickly and easily with a Cricut Maker and hot glue! Download FREE SVG file from above and upload to Cricut Design Space. Place felt on a fabric grip mat and press it down with a brayer. Cut out 5 petals in each size and one small multi-petal with rotary blade for dimensional DIY poinsettia. Cut out 3 different sizes of multi-petal and 5 leaves for flat poinsettia. Glue petals on stick for tall poinsettia or together for flat. Place a dab of hot glue in center and add some glass gold beads. The setting that worked best for me was "felt, wool fabric" with the rotary blade. Thank you so much for stopping by! Now, grab some coffee or hot cocoa and let the inspiration continue with this link party hosted by The Country Chic Cottage, 30 Minute Crafts, Mad in Crafts and 100 Directions!